Why Partner with the IVMF? Subscribe to our email newsletter, reports, and releases to get the latest IVMF news and research. Connecting Fortune 500 procurement specialists with veteran and military spouse-owned businesses! Flip through our album above from previous VetSource events! 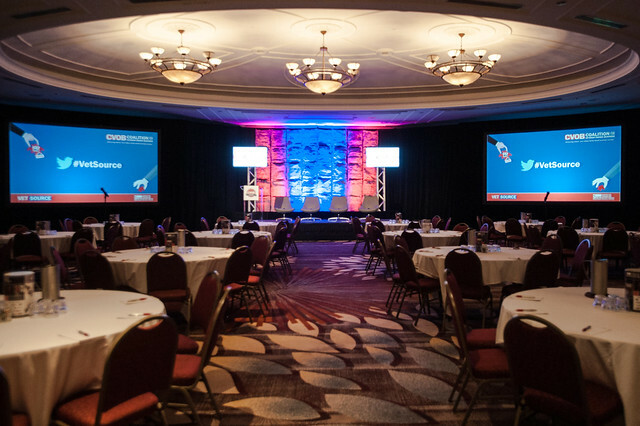 The Institute for Veterans and Military Families (IVMF) and Coalition for Veteran Owned Business (CVOB) are excited to host a one-of-a-kind procurement event called VetSource! WHAT: Join us, along with procurement executives from some of the largest companies around the country, for a day of procurement focused panel discussions, networking, resource connections, and breakout sessions. This one-day event seeks to help veteran and military spouse-owned businesses gain valuable resources, information, and best practices around corporate supplier diversity and procurement readiness to help them grow their companies and find supplier opportunities. Join the CVOB and Procurement Executives at the Hilton Dallas Anatole hotel for a day of procurement focused panel discussions, networking, local resource connections, and a keynote address! Learn the “ins” and “outs” of procurement and make connections with executives and procurement professionals at some of the largest companies around the country. For more information, please email coalitionvetbiz@syr.edu. In support of Syracuse University's institutional commitment to serve veterans and the military community, JPMorgan Chase & Co. partnered with Syracuse University to launch and sustain the Institute for Veterans and Military Families. Having trouble accessing this page due to a disability? If you have trouble accessing this page because of a disability, please contact the IVMF Office at 1-315-443-0141 or email vets@syr.edu. We will strive to reply to your request within one business day. Please include in your message your name, the nature of your request, and a phone number and/or email address where you can be contacted. Don't miss your chance to attend V-WISE Buffalo. Institute for Veterans and Military Families will use the information you provide on this form to be in touch with you and to provide updates and marketing.